Vitamin C is a potent antioxidant which helps protect tissue against the potentially damaging effects of free radicals. It is required for the production of collagen, the most abundant protein in the body used to form skin, hair and nails. Vitamin C supplements are chosen to support the immune system. Vitamin C is water soluble and needs to be continuously replaced. Vitamin C (with hypromellose), di-Calcium Phosphate, hypromellose, Citrus Bioflavonoids Complex (Citrus Powder, Calcium Sulphate, Cellulose, Stearic Acid, Magnesium Stearate, Guar Gum), Non-GM Soya Lecithin, Magnesium Stearate, Glazing agent: hypromellose. Below are reviews of Vitamin C - 50% Extra FREE - 60+30 x 1000mg Tablets by bodykind customers. If you have tried this product we'd love to hear what you think so please leave a review. Very pleased with the purchase and the price. Still taking these tablets, have taken them for years and when all around me are suffering with a debilitating cold I am fine. 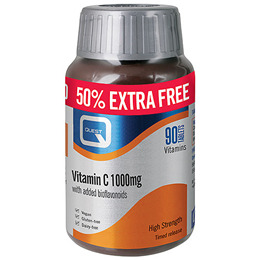 Quest Vitamin C 1000mg is a high strength Vitamin C supplement. Vitamin C is a potent antioxidant which helps protect tissue against the potentially damaging effects of free radicals.